Alexander is a PhD Candidate and Interdisciplinary Doctoral Fellow at the University of Minnesota studying plant breeding. He is advised by Dr. Kevin Smith. His research seeks to uncover the genetics and biomechanics of lodging resistance in cereal crops. He employs a range of research techniques from genomics to video analysis, in fields and wind tunnels, to better quantify and relate phenotypes critical to lodging resistance. Previously, his Masters research quantified genetic variation for pH adaptability in the woody genus Rhododendron, as well as the population genetics of the wide-ranging US azalea Rhododendron viscosum. He intends to graduate in August 2019 and looks forward to working with plants, technology, and people thereafter. Abstract: Violent movement of crop stems can lead to failure under high winds. Known as lodging, this phenomenon is detrimental to cool-season cereals such as oat, barley, and wheat; contributing to yield and economic losses. Phenotyping movement of cereal crops in real-time could aid in the breeding and selection of lodging resistant cereals. Since no methods exist to quantify dynamic plant responses to wind in an agricultural setting, we devised video and signal analysis methods to quantify mean frequency and amplitude of plant movement for a 360 degree field of view camera system. Through these methods, we detected significant differences in the natural frequency and amplitude of plant movement from video of 16 cereal cultivars (wheat, oat, and barley) planted in a randomized complete block design grown in 2017. Natural frequencies quantified by this method averaged 1.43 Hertz (Hz) with a significant cultivar effect, while 2.5-fold differences in amplitude were detected across the 16 cereal cultivars. Wheat cultivars had an average natural frequency of 1.56 Hz, which was significantly higher than the experimental mean. Furthermore, wheat cultivars were 10 degrees more upright on average following a lodging event. This method opens the possibility of deciphering and selecting morphological traits that increase lodging resistance in cereals via measuring movement under natural wind stress. By blending analytical approaches from breeding, agricultural engineering, and acoustics, we can systematically differentiate small frequency and amplitude differences in cultivar movement that may capture previously unquantifiable variation of cereal lodging resistance. 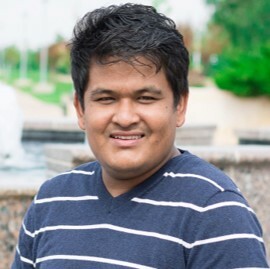 Bal Krishna is a master’s student in the Plant Biotechnology program of Dr. Muthusamy Manoharan at University of Arkansas at Pine Bluff. He is from Nepal and received his BS in Agriculture Science (Agronomy) at Tribhuvan University, Nepal. He came to US for MS at University of Arkansas at Pine Bluff, Arkansas in 2017 and he has been working on CRISPR/Cas9 mediated gene editing. His current research project is in Chalk5 gene which contributes to chalkiness in the endosperm of rice grains. The objective of his research is to edit Chalk5 gene in rice using CRISPR/Cas9 technology to reduce chalkiness. He wishes to graduate and advance his career in the sector of plant breeding and crop improvement that can help in improving crop yield and nutrition. Abstract: Chalkiness is a major problem in rice that determines quality and price in the market. Chalkiness is determined by multiple quantitative trait loci (QTLs) in different chromosomes of rice genome. Among them, Chalk5 (LOC_AP014961.1) is one of the major gene in chromosome 5 that contributes to chalkiness in the endosperm of rice grains. The objective of this study is to edit Chalk5 gene in rice using CRISPR/Cas9 to reduce chalkiness. ORF2, CACT and RY/G sites in the Chalk5 locus are known for their role in increasing chalkiness in rice. Two vectors, one with two guide RNA (gRNA) and another with three gRNAs, were constructed for editing the specific sites. Agrobacterium mediated transformation was carried out to develop T0 plants: 26 and 29 independent events of 2 spacers and 3 spacers were developed respectively. PCR was carried out to confirm the presence of M13/Ubiquitin, Cas9, Hygromycin and gRNAs in T0 plants. The editing was confirmed in T0 plants in the spacer regions using Sanger sequencing. Editing was observed in 21 independent events containing 2 spacers (80.76%) and 24 independent events containing 3 Spacers (82.76%). Null segregants from 6 independent events in each 2 spacers and 3 spacers were identified with InDels observed in same region as in the T0 plants. The null segregants will be subjected to qRT-PCR for gene expression analysis. Gina Sideli is currently a Ph.D. candidate in the Horticulture and Agronomy Graduate Group at University of California, Davis. She completed her B.S. degree in biology at Stony Brook University, and her M.S. degree in botany at California State University, Chico. The objectives of her dissertation research are the development of automated, high-throughput phenotyping methods, and the evaluation of the genetic architecture for two traits in walnut. Her main research interests are genomic predictions, phenomics and the use of genome-wide scans to uncover QTLs underlying trait variation. Abstract: Traditionally, phenotyping of walnut traits is based upon qualitative scores which can be inconsistent and introduce bias depending upon the human observer. This work demonstrates a collaborative effort between biologists and engineers where a precision phenotyping method was developed in walnut which enabled the discovery of QTLs. Walnut suture strength is an economically important trait for the UC Davis walnut improvement program (WIP) and walnut industry in California. Quantitative, automated measurements captured by a texturometer have been evaluated as a replacement for qualitatively scaled measurements estimated by humans. Using data collected on WIP trees (n = 524) for two years (2015, 2016) narrow sense heritability was higher with the quantitative measurements (0.807), rather than the qualitative measurements (0.335). Genetic maps were constructed with a subset of 4,000 SNPs utilizing genotyping data generated from our Axiom® 700k SNP array on a bi-parental population Chandler x Idaho (n = 173). A stable QTL across two years was found by QTL mapping on chromosome 5 (LOD = 11.74) and explained 21.54% variation in Chandler; for Idaho, a major QTL was revealed on chromosome 1 (LOD = 5.68) which explained 14.74% variation. Marker-trait associations, found in QTL mapping on chromosome 5 were confirmed in GWAS for the 524 trees representing 39 distinct full-sib families. Utilizing the qualitatively scored method, alone, there was not a significant, and stable QTL. Thus, precision phenotyping coupled with robust genotyping data has facilitated the detection of causative loci underlying genetic control for suture strength in walnut. Introduced in the year 2016 to foster interaction between graduate students studying plant breeding at Texas A&M and the students studying plant breeding or a related science at other institutions. The program encourages information exchange on research ideas and promotes networking among students at the symposium. The scholarship is solely administered by the symposium organizing committee and is fully funded by Corteva. Three students will be selected to present oral keynote lectures during the day of the symposium selected by the organizing committee. The presentation will be a 5 minute rapid oral followed by 2 minutes of questions. In addition, awardees will present a poster of their research to allow for follow-up discussion during the poster session. All three students selected will receive $450 scholarships. Finally, presenters will have the opportunity to arrange meetings with local researchers the following day. Applicants must be full-time graduate students at United States college affiliated institutions. All applicants must upload their "Presentation Title”, "Presentation Abstract," and other required information into the student competition sign-up form. All applicants must send their research presentation electronically no later than the day prior to the scheduled presentation. Selected applicants must submit a biographical PowerPoint slide. Students in the Texas A&M University system are ineligible to apply. Applicant must agree to arrive at AUS or IAH airports before 4 PM on February 20 and stay through 1:00PM February 22. The suitability of the conference presentation (including appropriate length, clear results obtained, and appropriate conclusions). The Graduate Student Organizing Committee will evaluate blind abstracts to select the three awardees. *In fairness to other participants, abstracts that are over the specific word limit will automatically be disqualified.